Educational Kids Games Can Be Fun! Is it possible to actually have fun playing educational kids games, especially in your homeschool? For years we have been enjoying some great educational games for kids. The list that we have come up with contains individual, group, and word games. These are ten games that we are sure you will like. Shape by Shape - Binary Arts	This game has two different color shapes that you try to fit into the square frame to make the pictures on the cards. You can also get two games to race against each other, which is a lot of fun. Rush Hour – Binary Arts	The square grid with columns and rows has an opening on one side through which you attempt to get your red car. The catch is that you have a bunch of other cars and trucks in the way that you will have to move. This is probably one of our favorite learning games for kids to play yourself. 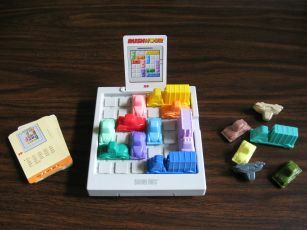 GoGetter2 – DaMert Company	This game has small squares with road and water paths that you have to move around to get one thing connected to another. The challenges get harder as you move along, and you have to get more than one thing to connect to the other. Mad Dash! – Mad Dash! Enterprises	All of the states of the US are on different cards that get passed out to every player. The object is to get from one side of the US to the other, or to get more cards lined up than anyone else. This is one of the greatest educational games for kids to learn their U.S. geography. World Dash! – ITOS Enterprises	This game is played just like Mad Dash!, but with an added challenge-you have to navigate the whole world! Into the Forest – Ampersand Press	This fun card game is great at teaching the food chain of plants and animals in the forest. SET – SET Enterprises, Inc.	After twelve cards are laid down face up, you rush to find a connection between three. The cards have different shapes, colors, and can be solid, striped, or empty. This is a great fast moving, competitive group educational kids game that encourages logical thinking. Let’s Go Shopping – Trend Enterprises Inc. This is one of the fun educational kids games that teaches kids about money. Question cards challenge your child’s ability to do percents, compare prices, and also develop critical reading skills to understand the questions. SomeBody - Aristoplay, Ltd. (Mom decided to add this game.) It comes with four plastic body boards for placing the removable body parts on. Children learn where twenty body parts are located and how they function. 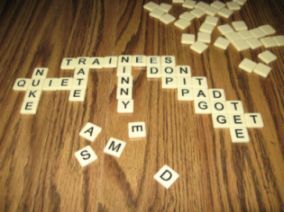 Bananagrams – Bananagrams	Similar to Scrabble, this game has tiles with all the letters of the alphabet on them. The difference is that rather than having to take turns on a board, you are all playing at the same time in a race to be the first to get rid of all of your own tiles. We played this at Easter with the whole family and everyone absolutely loved it! This is for sure one of the best educational kids games. We have a whole closet full of games, some better than others. We know that from this list of educational games for kids you'll find one that everyone likes! Have fun learning together!